3400E01520401 intermec 3400E thermpr us 8K/128K 802. Subject: 3400E01520401 intermec 3400E thermpr us 8K/128K 802. The EasyCoder 3400e is a versatile industrial strength printer based on the rugged, field-proven EasyCoder 3400. The 3400e features throughput that is up to 10 times higher than the 3400, making it ideal for today's increasingly complex labels combining 2D bar codes, mixed fonts and graphics. This means no waiting for labels to print! The 3400e continues to offer the legendary reliability of the 3400 print mechanism. The steel frame enclosure gives the 3400e a rugged platform to withstand harsh industrial environments. The attractive gray metallic enclosure is designed to mask dirt and grime for ease of maintenance. 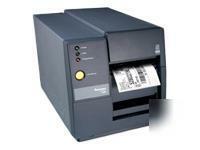 This is a powerful printer that is designed and built for a wide variety of industrial bar code applications.